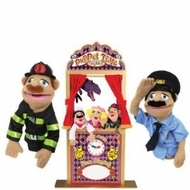 Your children will be able to emulate their favorite police and firefighting heroes with the Melissa & Doug Deluxe Theater with Police Officer and Firefighter puppets (item numbers 2551 and 2552, respectively). Two puppeteers can use the theater simultaneously and this set includes a chalk board panel for playbill information in addition to the puppets. This theater available at Today’s Concept at a low price is rated for children ages three and older.